Arab Thieves Steal Israel’s Blessing of Honey - Breaking Israel News | Latest News. Biblical Perspective. One woman’s dream to bring to life Israel’s blessing as a land flowing with honey came crashing to the ground two weeks ago when local Arabs broke into her factory, stealing an entire season’s supply of honey. Her plight is only one example of an epidemic facing every branch of Israeli agriculture. 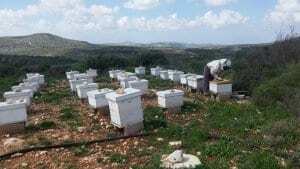 Yael Farbstein began Dvash Kedumim, or Kedumim Honey, in Kedumim in Samaria six years ago. Her passion produced remarkable results in February when she won the prestigious annual Black Jar Honey Tasting Contest held by the Center for Honeybee Research in Asheville, North Carolina. Hundreds of honey producers from around the world competed, so Farbstein was thrilled when she won first place in the category of the International Multi-Floral Sourced Honeys. Two weeks ago Arabs broke into Farbstein’s factory. They stole precious equipment and caused damage, but worst of all, the thieves stole every last jar of honey, an entire season’s worth of labor. Nothing remained, not even the jar of prize-winning honey Farbstein had set aside as a keepsake. The loss was doubled last Sunday morning when Farbstein returned from her Sabbath rest to find that the thieves had struck again. 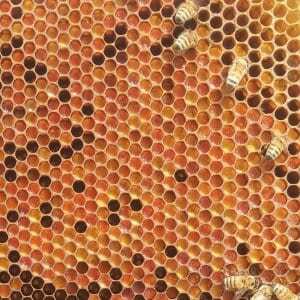 In an act of pure destruction, they had plugged up the hives remaining in the fields, leaving the bees to die in the summer heat. The loss of the bees set back Farbstein’s business even more, but the trial was still not over. Adding insult to injury, the thieves returned Monday night to steal the security cameras that stood watch over the now empty factory. Farbstein explained that every Israeli who works in agriculture suffers from this plague. According to the Oslo Accords signed in 1995, the Israeli Police are not allowed to enter areas under Palestinian Authority jurisdiction. An Arab who steals from a Jew in Judea and Samaria is never more than a few minutes away from a politically sanctioned hideaway. Not only is theft an issue, but vandalism is rampant. Farbstein related how a nearby farm recently had a barn full of hay burnt to the ground. She related that irrigation systems, miles of pipes that must remain in the field to be effective, are frequently destroyed for no reason. Farbstein is struggling to keep her spirits up since she has much work ahead to prepare for the next season. The blow to Farbstein’s business comes just a few weeks before the holiday of Rosh Hashana, when all of Israel will be dipping apples in honey in a tradition meant to bring a sweet year. But this year, her very special honey will not be part of this. To support Yael Farbstein by donating to an emergency campaign helping her honey farm recover from this blow, click here.